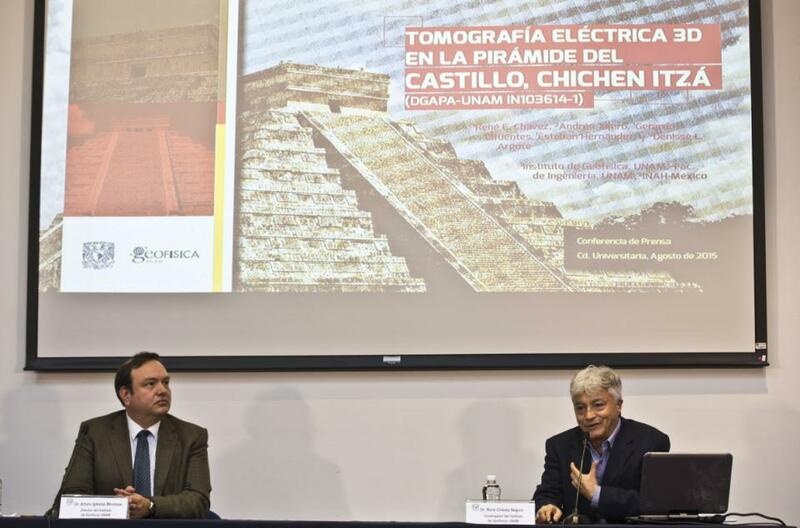 MEXICO CITY (AP) — Mexican experts have discovered that the main pyramid at Mexico’s Mayan ruins of Chichen Itza was at least partially built atop a subterranean river. 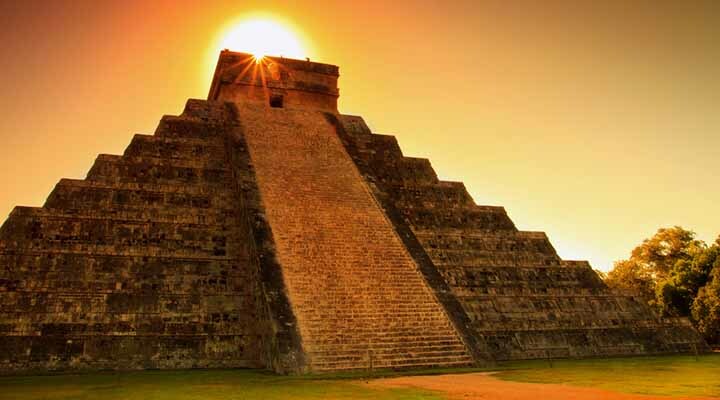 Experts from Mexico’s National Autonomous University say they found a subterranean cavity about 20 meters (yards) deep below the pyramid of Kukulkan, also known as El Castillo. Geophysics expert Rene Chavez said Thursday the underground river chamber is naturally covered by rock. Such underground rivers often connect the open “cenotes” or sinkhole lakes, that dot Mexico’s Yucatan peninsula. The discovery was made using an electrical resistance survey, not by excavating. Chavez said one corner of the pyramid rested on the underground chamber, so it was in danger of collapsing. Archaeologist Guillermo de Anda said the discovery was important. De Anda, who did not participate in the study, said it may confirm that the Mayas included symbolic maps of their cosmology in their temples and sacred sites. The cenotes that surround the pyramid could represent the four points of the compass. The river at the center might represent the center of the Maya’s universe, which they thought of as a tree with roots reaching below ground. Also Thursday, the National Institute of Anthropology and History said research at another Mayan site, Uxmal, found an usually high number of medicinal plants growing nearing the structure known as the governor’s palace. Uxmal site director Jose Huchim Herrera said the concentration of such plants was so much higher in the sacred area than in surrounding fields, that it indicates the Mayas planted them there intentionally as a sort of medicinal garden. The site has about 150 species used to treat snake bites, stomach infections and fevers. 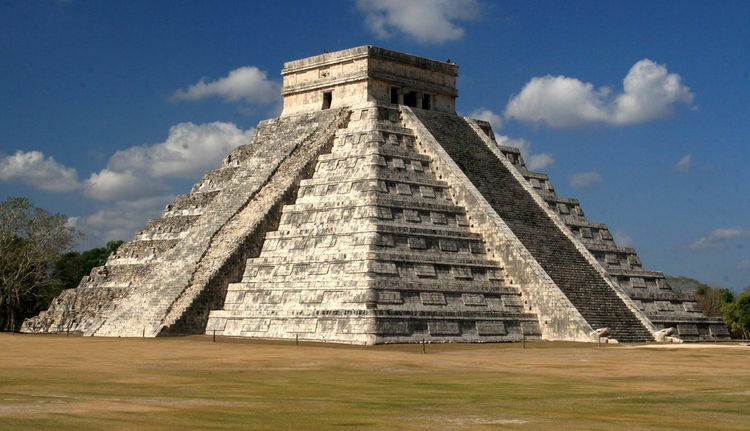 One of the best known buildings in Chichen Itza is Kukulkan’s Pyramid. It is also known as El Castillo. This pyramid has nine tiers that lead to a platform that holds a two-story temple on top that was dedicated to the Mayan god called Kukulkan. It stands about 24,3 meter tall. That is as tall as an 8-story building. There are 91 steps up each of the four sides of the pyramid plus 1 step up to the platform. That equals 365 steps in all; one step for each day of the year. The Mayans connected the number of steps to their calendar. Mexico, Kukulkan’s Pyramid, also known as El Castillo.